DOC mystery photo: From when female officer uniform included skirt or slacks. Recognize anyone? Location? Year? Occasion? See suggested answers below. Click peopled portions of photo for close-ups of officer groupings (left, left of center, right of center, right). Click peopled portions of photo to access close-ups of officer groupings (left, left of center, right of center, right). Above are four images sectioned off from a NYC DOC officers group photo. The four section images are so positioned as to appear a single image. Clicking on any one of these four section images -- left, left of center, right of center, or right -- accesses a corresponding close-up view of the officers in that section. Each of the close-up section image pages provides navigation links to move between the four close-up view pages or to return to this page. To access the picture as a single (un-sectioned) image, click the image below and to the right. Double click this image to access a 218 Kb single JPG image (un-sectioned) of the group, slightly less than 10 inches wide and 8 inches in height. Use your browser's "back" button to return to this page. 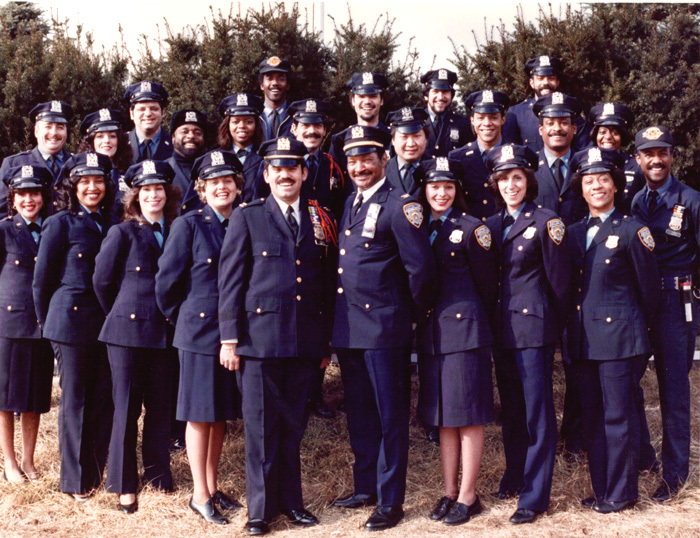 If you can remember when NYC DOC female officer uniforms could include skirts and/or slacks, then you may recognize people in this group photo, or even be one of them. Mention is made "skirts and/or slacks" to establish the era as at least pre-July 1, 1999, when Directive 2270 ended the skirt option for female officers' uniforms and made slacks mandatory. Of the 10 women in the photo, seven are visible in the front row; of these, three can be seen wearing skirts as part of their uniform. Thanks to those current and former DOCers who provided names and other information, suggested sources of information, and expressed words of encouragement. They include Ali Al Rahman, retired CO Jerry Signorelli, Deputy Director Alexis Castillo, Juan Suarez. Evelyn Mirabal, Program Coordinator Jeffrey G. Jackson, Isabel Cartagena, Floyd Schwartz, Diane Johnson, Miles Gordon, Donald Caggiano, John Murphy, Scott Van Nostrand, Sharon A Ray, Emelia Knox, Tracy Mirabal, Christine Parker, Erika Vernon, Capt. Carolyn Saunders, Officer Ralph Smith, retired Warden McNellis, ADW Rebecca M. Grayson, Asst. Chief Arthur Olivari, Capt. Vincent Valerio, DOI; Capt. Joseph Miller, Director of Finance Scott Mayer, Warden Peter Panagi, Officer Joseph Carbone, Associate Staff Analyst Pier Campbell-Pagán and Regina D'Elia of CCA. While emails from all the afore-mentioned contributed to "solving mysteries" about the photo, the latter four persons were particularly systematic in their approach, going row-by-row filling in the names. If anyone who emailed the webmaster about the "mystery photo" is not among those listed in the above paragraphs or below, please call his attention to the omission and he will update the page to rectify the oversight. Likewise, those who didn't include their rank or job title in their emails could send the information along in an email to add that to their mentions in the paragraph, if they wish. Some of those mentioned with their rank or title, either had included them in their emails or the webmaster happened to know what they were. The emerging consensus appears to be that the photo was taken in 1982 on Rikers Island in an area known in that pre-GRVC era as the Beacon, so named because a radio beacon servicing LaGuardia Airport was once located there. The people in the group photo were a mix of Correction (Training) Academy staffers and members of the Department's recruitment team. The recruiters were based at the Academy then situated behind what is now EMTC. The photo's occasion is vaguely remembered as being social rather than formal or official. Above, left half of group. Below, right half of group. Josie Lebron, former officer* . Jimmy Hunter, retired acting commissioner. Brian Sharkey pointed out that, "Beside the skirts, the female CO's shirts were a different color and they also wore a different tie." Evelyn Mirabal noted, "ADW Diane Kevalier was Guardians president." Capt. Miller recalled Henry Lee from Manhattan Court Pens. Sharon Ray remembers Diane Kevelier and Martha Slade as Academy instructors. Floyd Schwartz pointed out that Jimmy Hunter was formerly Supervising Warden before he became Acting Commissioner. ADW Rebecca M. Grayson mentioned, "This looks like a group that worked at the old Academy, when it was on Rikers behind C-76 (EMTC now)." Ali Al Rahman commented,"I looked at the photo and you should see the smile on my face. Gloria Murlie and Kathy Ladalia are the 2 I recognized right off. Heck, I am still grining. Thanks." Retired CO Jerry Signorelli wrote, "This photo was one of many recruitment photos taken. . . . during the 1980s." "With regard to the mystery photo...I was privileged to be assigned to the Academy and an instructor and Commanding Officer of the Recruitment Unit. 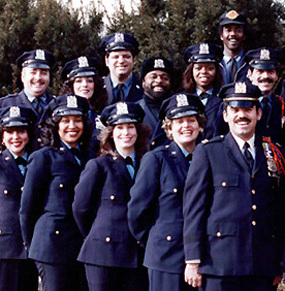 I worked with a group of people whom I regard to this day were dedicated professionals who represented the department and the City of New York at its best. "Commissioner Ramos ultimately became its director and was responsible for allowing me to lead one of the most, if not the most successful recruitment teams within any city uniformed forces. I do believe that this photo was one of many taken to be used for a poster and flyer campaign which were displayed in store fronts, city subway and bus system, with a phone number to call for career information. "Perhaps [retired Deputy] Commissioner Ramos would be able to confirm this." Retired Deputy Commissioner Joseph Ramos wrote: "Hi Tom, I just saw the Recruitment Mystery Picture. "Relative to those in the picture: The group was composed of members of the Academy, Billy Simmons from CERT, and members of my recruitment team before they became a UNIT. Capt. William (Bill) Mendoza was the Commanding Officer of the Unit. "Jerry Signorelli is right. This was one of MANY of the first pictures that I took in developing [and] in promoting Diversification in our department. You will notice that we represented the composition of the members of our community. You will also note that there are members of different ranks. "This recruitment team worked out of the old church on Rikers Island that we converted into our Recruitment Headquarters. "I still have a lot of pictures of the Department that someday I will be sending to you. 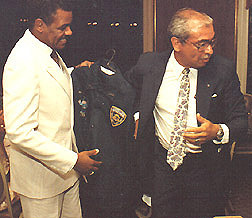 Then CO James Vann, left, and Deputy Commissioner Joseph M. Ramos display an "Officer Correct jacket" at a small private reception that the Recruitment Team held for Jimmy upon his retirement. Click image for Officer Correct web page. "With regard to the OFFICER CORRECT PROGRAM [that I] developed . . . . Jimmy was my Illustrator with input of the team and Kathy Dawkins who is now working for the Department of Sanitation. This was the first program that took the Correction Officers into the schools. In one year we serviced approximately 10,000 youngsters in schools troughout the metropolitan area. After that, others tried to emulate. . . .
"Lastly, the picture with Jimmy and myself [on the Officer Correct web page shows] a jacket that I had made up for Jimmy for his retirement, the same jacket that I developed for senior staff of the Department. 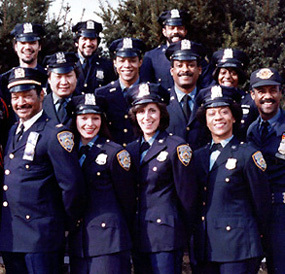 It is important to note that we in the Department of Correction were the first uniformed force that implemented [such] jackets. I still have mine. "I hope that you find this information helpful." Officer Lewis Cash, now retired, may have been the one taking the photo. He was a member of the recruitment team that would send two or three recruiters together to speak with students at schools to encourage them to think in terms of Correction careers. While a good deal more about the "Mystery Photo" is known now than when first posted on our web site early December 2007, some specifics remain in doubt. The exact nature of the social occasion prompting the picture taking isn't clear. Retired Correction Officer Jimmy Vann, who among other things used to do the illustrations and cartoons for DOC newsletters and other departmental publications, passed this image along to the New York Correction History Society web site. He believes our site's regular visitors might find it interesting and might even fill some of the gaps in what information we have about this picture. Meanwhile, Jimmy has asked retired DOCer Billy Simmonds, who sent him the image along with some others a while ago, to check what notes he may have on those photos to help fill the information gaps. Anyone with information shedding more light on this "mystery photo" can email at the e-address below. Return to NYC DOC history menu page.